The Dell G7 15 is a mid-size gaming laptop with middle-of-the-road GTX 1060 Max-Q graphics, middling battery life, and—you guessed it—a mid-range price tag of $1,200. But this system boasts a stellar feature that sets it apart from the crowd: a hex-core, benchmark-crushing Core i7 processor that’ll thrill content creators. Indeed, the G7 15’s overall performance is only a step or two behind that of our current 15-inch gaming laptop, the thinner and lighter MSI GS65 Stealth Thin 8RE, while costing about $600 less. Among our quibbles: a dim screen and an occasionally too-hot chassis. This review is part of our best gaming laptops roundup. Go there for details about competing products and how we tested them. We tested the $1,199 model of the Dell G7 15 (Model 7588), which comes with Intel’s hex-core Core i7-8750H processor, 16GB of DDR4 RAM, a 128GB solid-state boot drive and a traditional 1TB hard drive for data. With a total of 12 processing threads (thanks to Intel’s Hyper Threading technology), the G7 15 packs in an eye-popping amount of multitasking power, as we’ll see once we get to our benchmarks. On the visual side, the G7 15 boasts a 15.6-inch anti-glare full-HD (1920×1080) IPS-technology display, plus an Nvidia GeForce GTX 1060 processor with 6GB of GDDR5 RAM and Max-Q design (which puts a lid on performance to cut power consumption and heat output). Sitting in the middle of Nvidia’s GeForce GTX 10 Series video cards, the GTX 1060 with Max-Q reliably delivers 60 fps and up for most current top-tier games. You can knock about $120 off the price tag of our G7 15 review unit by snapping up a model with 8GB of RAM rather than 16GB, while the priciest version swaps in a beefier, overclockable hex-core i9-8950HK processor. There’s also a G7 15 laptop with a 4K display (plus the standard i7-8750H CPU) for $1,499. Incidentally, every laptop in Dell’s G7 15 line comes with the same GTX 1060 graphics card with Max-Q design. 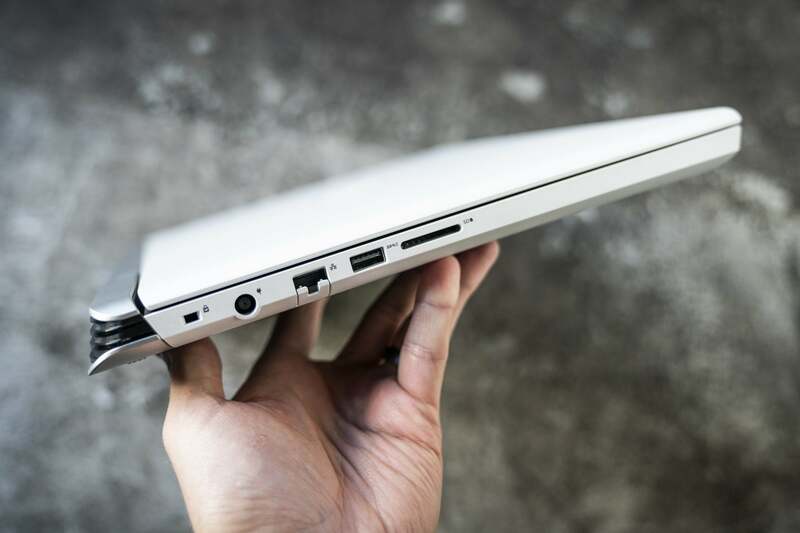 Measuring 15.32 x 10.82 x 0.98 inches and weighing a substantial but not prohibitive 6 pounds, 4 ounces (or 7 pounds, 2 ounces with the chunky 180-watt AC adapter), the Dell G7 15’s heft paradoxically makes it feel thinner than you’d expect. That said, the G7 made for a tight squeeze in my 15-inch laptop bag. 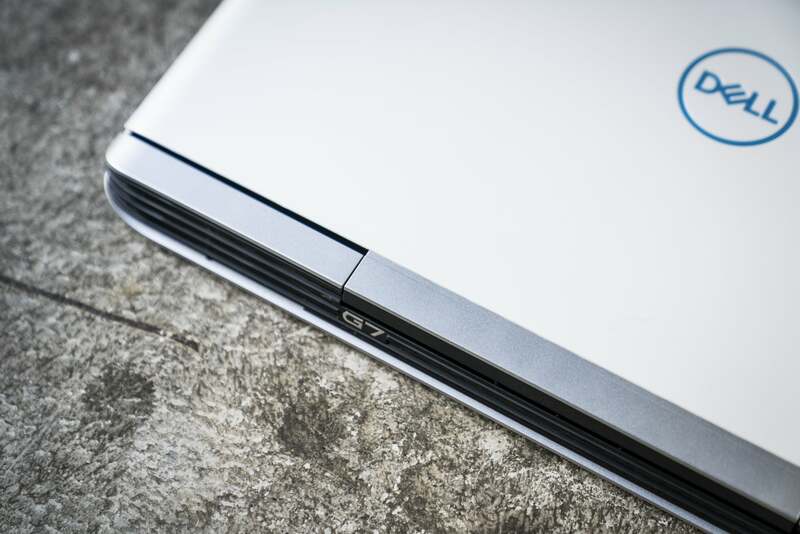 The twin cooling vents in back of the Dell G7 15 look understated, yet awesome. 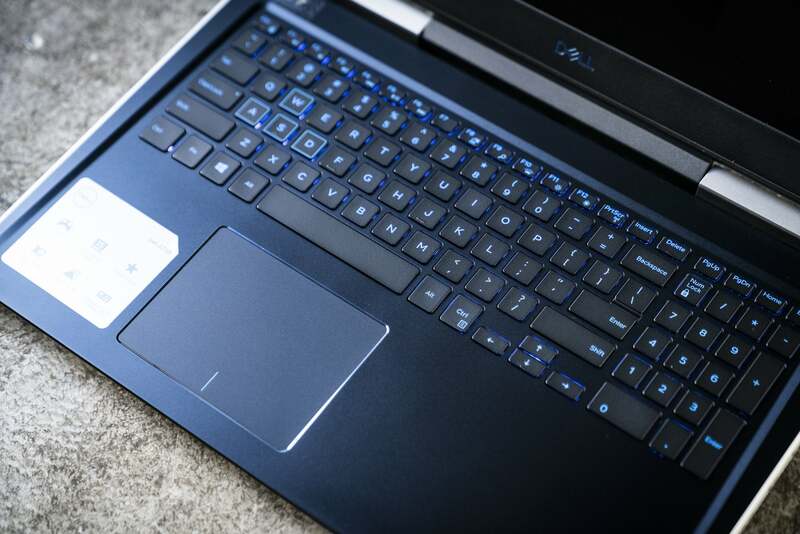 Available in “Licorice Black” and “Alpine White” flavors (we tested the Alpine White variety), the Dell G7 15 boasts a sporty yet understated look. The plain, somewhat inconspicuous lid is offset by a slanted front edge that boasts a nifty black grille, while the twin cooling vents in back look elegant and powerful. Opening the lid reveals a relatively thick bezel (about three-quarters of an inch along the top and sides, plus an inch at the bottom) around the 15.6-inch display, plus a smooth, jet-black palm rest that’s slightly indented around the keyboard. The Dell G7 15’s non-touch, 1920×1080 display boasts solid viewing angles. The display dims a bit starting around 45 degrees from the sides, top and bottom, with no signs of inverse colors as you might see on a cheap laptop screen. That’s pretty much par for the course when it comes to an IPS display like the G7’s. The Dell G7 15’s 15.6-inch IPS display delivers good viewing angles, but we wish it was brighter. 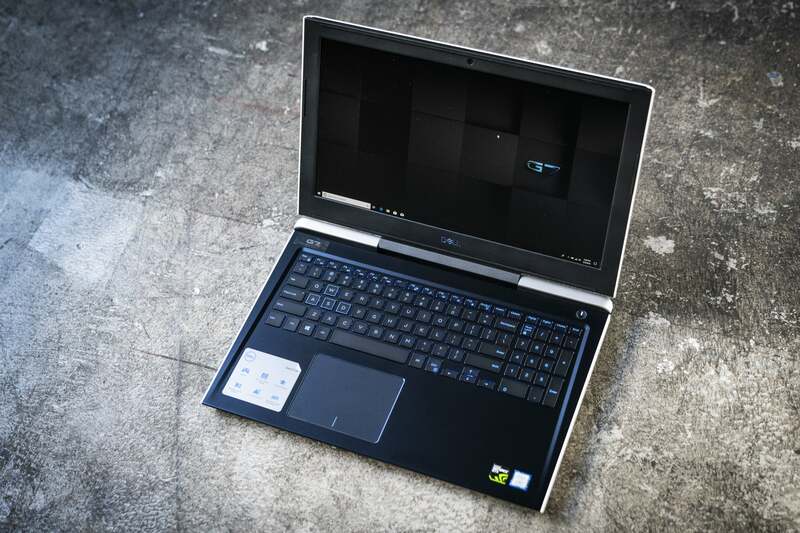 While the Dell G7 15’s viewing angles look good, the same can’t be said for brightness. Measuring just 234 nits (or candelas), the G7’s screen brightness falls somewhat short of the 250-nit minimum we prefer. In an office setting or a den, the G7 15’s dim screen isn’t a huge problem, but I had trouble making out one of the darker levels in Diablo 3 while I was gaming near a bright window. The Dell G7 15’s chiclet-style keyboard is standard mid-range laptop fare, with smooth, flat keys, decent travel and a snappy tactile bump in the middle of each keystroke. The outlined WASD keys did their respective jobs during gaming, neither impressing me nor getting in my way. A 10-key numeric keypad sits on the right, while standard function-enabled hotkeys such as screen lock, search, brightness, media playback, and airplane mode are also on tap. The G7 eschews fancy LED backlighting schemes for a basic two-step blue glow. Nothing about the Dell G7 15’s backlit keyboard screams “gaming” except for the outlined WASD keys. Stationed a little left of center to keep it directly below the spacebar, the Dell G7 15’s mid-size trackpad responded to my swipes with a minimum of jitter, while also avoiding mistaken inputs from my palms. Clicking feels a little stiff, per usual, but that shouldn’t matter much to gamers, who will probably be using mice most of the time. Video captured by the Dell G7 15’s webcam (its lens sits in the top bezel of the display) looks typically grainy and blotchy, albeit with decent contrast and color. While the G7’s webcam is fine for Skype, gamers looking to make waves on Twitch would do better with a dedicated lens. The Dell G7 15 comes with a solid selection of ports, starting on the left with an ethernet port, USB 3.1 Gen. 2 Type-A, and an SD memory card reader. Also on the left side: a Noble lock security port and a barrel-shaped power-in port. 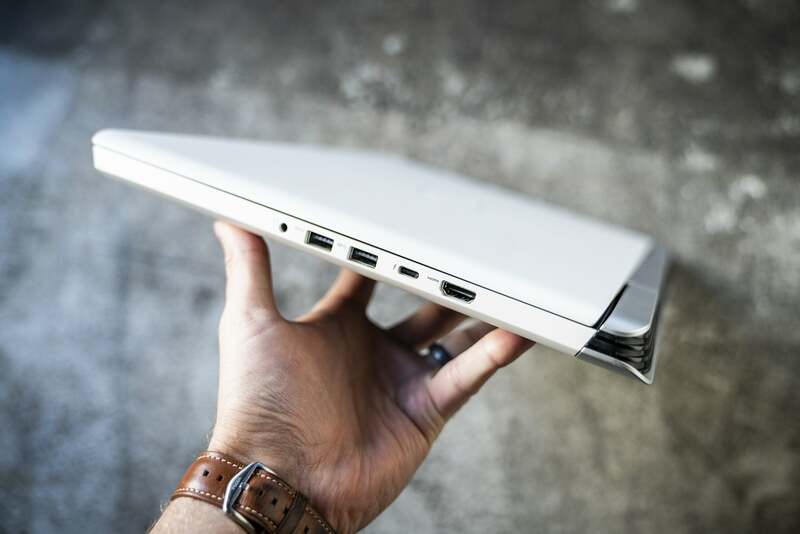 The left-side ports on the Dell G7 15 include ethernet, a USB 3.0 port, and an SD memory card reader. On the right side of the G7 15, you’ll find HDMI 2.0, a Thunderbolt 3 port, two more USB 3.1 Type-A ports (with PowerShare), and a combo audio jack. A Thunderbolt 3 port sits on the right side of the Dell G7 15, along with HDMI 2.0, a pair of USB 3.1 Gen 1 Type-A ports, and an audio jack. While the Dell G7 15’s middle-of-the-road GTX 1060 Max-Q video card delivers expectedly mid-range graphics performance, its hex-core CPU—among the first we’ve seen in a relatively thin gaming laptop, although we can expect many more in the near future—cranked out some truly impressive numbers, perfect for gamers who want to take a break from shooting things to create other things. In our first benchmark, we use the free HandBrake utility to encode a 40GB video file into an Android tablet-compatible format. It’s a CPU-intensive job that can take an hour or more to complete, and it tends to spin up cooling fans in the process. While a good HandBrake score doesn’t necessarily equate to stellar gaming visuals (we’ll get to gaming performance in a moment), it does bode well for YouTube content creators, Twitch broadcasters, or anyone else who plans on multitasking while gaming. The Dell G7 15 chewed through our Handbrake benchmark thanks to its speedy hex-core i7 CPU. 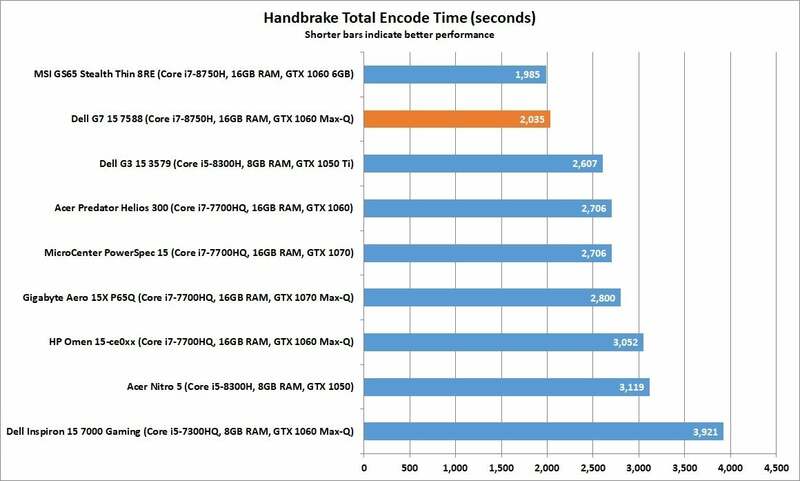 Processors with the most cores generally do better with HandBrake, and yes, the Dell G7 15 and its hex-core Core i7-8750H CPU absolutely crushes it. Indeed, with its Handbrake score of 2,035 seconds, or just a little over half an hour, the G7 15 trails only the similar hex-core MSI GS65 Stealth Thin 8RE, a razor-thin gaming laptop that costs $600 more. The next-fastest competitor in our comparison, the Dell G3 15 with a quad-core i5-8300H processor, took an additional 10 minutes to complete the Handbrake test, followed by a series of Core i7-7700HQ-powered laptops, demonstrating the difference those extra cores make when it comes to CPU-intensive tasks. Next up, our Cinebench test involves another stressful computing task: rendering a 3D image in real-time. Because Cinebench takes only a few minutes to perform, it gives us a good idea of how a given laptop handles short bursts of intense activity. 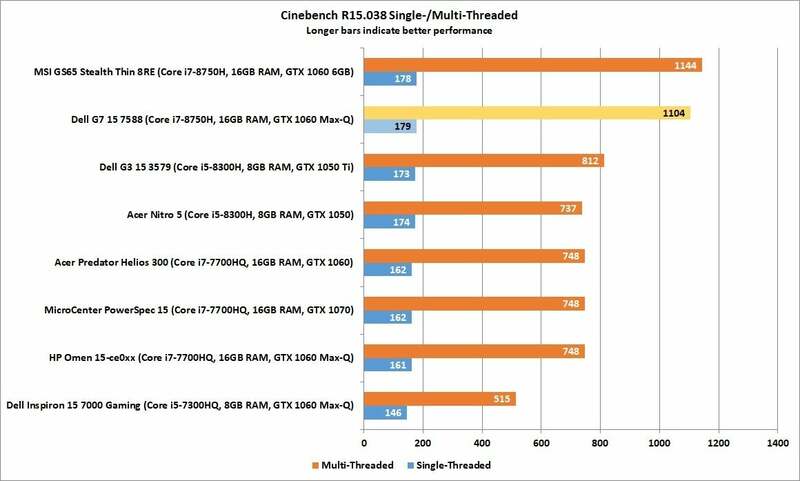 We run Cinebench in both multi-threaded and single-thread modes, handy for illustrating the performance benefits of additional cores and threads. The Dell G7 15’s Cinebench score shows what a difference six cores of processing power make compared to four. Unsurprisingly, the 12-threaded Dell G7 15 shines when it comes to Cinebench’s multi-threaded test, one again notching a score only slightly behind that of the MSI GS65 Stealth Thin 8RE, while handily dusting its quad-core competition. We’re also pleased by the Dell’s chart-topping single-thread result. 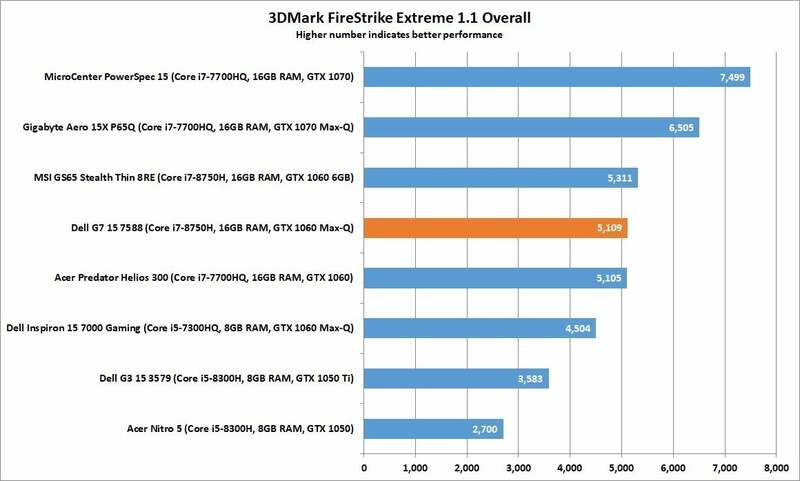 We’ll start our gaming tests with FireStrike Extreme, a synthetic benchmark that doesn’t directly translate to gaming performance but still gives us a good baseline for comparisons. The Dell G7 15’s mid-range GTX 1060 video card unsurprisingly lands it in the middle of pack when it comes to FireStrike Extreme. The Dell G7 15’s FireStrike Extreme score lands in the middle of the pack, which makes perfect sense given its GTX 1060 with Max-Q. The top two finishers in our chart, the MicroCenter PowerSpec 15 and the Gigabyte Aero 15X P65Q, boast more powerful GTX 1070 cards, while most of the laptops that trail the Dell have GTX 1050 GPUs. The MSI GS65 Stealth Thin 8RE with a similar GTX 1060 card (albeit using a full-fat configuration, compared to the G7’s power-optimized Max-Q design) manages a slightly better FireStrike Extreme score than the G7 15, but as we’ll see in a moment, it doesn’t make much difference when it comes to real-world gaming. Speaking of real-world gaming, let’s begin with 2013’s Tomb Raider reboot, a game that leans a little more on CPU power than more recent titles. 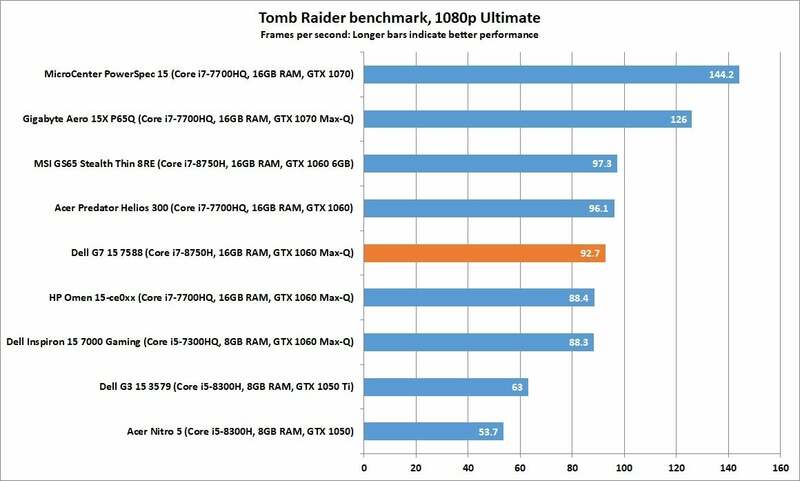 Without a GTX 1070 or better video card, the Dell G7 15’s Tomb Raider frame rates are stuck in the 90 range. We’d expect a laptop with a GTX 1060 video card to squeeze out a Tomb Raider frame rate somewhere in the 90s, and that’s pretty much what we got from the Dell G7 15. While the GTX 1060-powered MSI GS65 Stealth Thin 8RE enjoys (as we just saw) a slight FireStrike Extreme advantage over the G7, it gets only a modest Tomb Raider frame rate bump over the Dell (97.2 fps versus 92.7 fps). 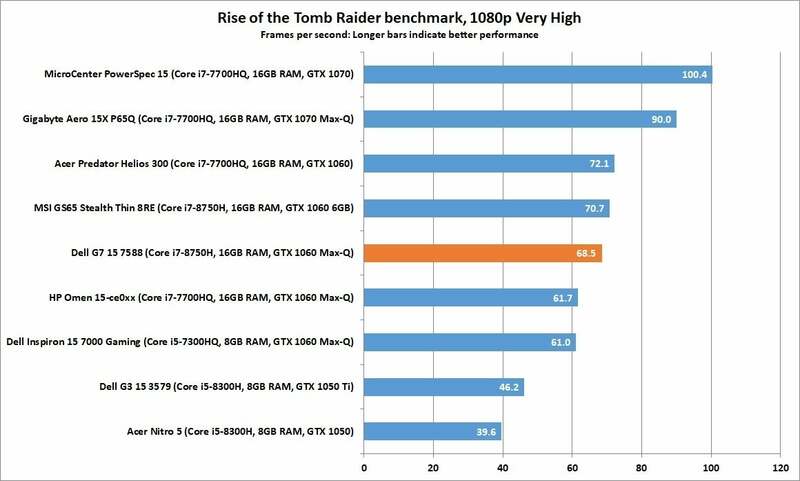 To see a more significant boost in Tomb Raider frame rates, you’d need to cough up more for a laptop with GTX 1070 or better graphics, such as the MicroCenter PowerSpec 15. We see more of the same with Middle-earth: Shadow of Mordor. All the GTX 1060 Max-Q-powered laptops in our chart—including the Dell G7 15—bunched up roughly in the 80-90 fps range, while a pair of laptops with full-fat GTX 1060 graphics saw a modest bump to 90-100 fps. As with Tomb Raider, the GTX 1060-powered Dell G7 15’s Middle-earth: Shadow of Mordor frame rates are (fittingly) middle-of-the-road. For Shadow of Mordor frame rates above 120, you’ll generally need to step up to a system with GTX 1070 or better graphics. Finally, we fired up Rise of the Tomb Raider, a graphically intense title that demands at least GTX 1060 graphics to achieve a smooth 60 fps. The Dell G7 15 and its GTX 1060 Max-Q video card can crank out Rise of the Tomb Raider above 60 fps, but only just. The Dell G7 15 and its GTX 1060 Max-Q graphics turn in a solid 68.5 fps, while the similarly equipped Acer Predator Helios 300 and MSI GS65 Stealth Thin 8RE sit in the same ballpark with 72.1 and 70.7 fps, respectively. Gaming laptops with GTX 1070 or better graphics (like the MicroCenter PowerSpec 15) can wring more than 100 fps from Rise of the Tomb Raider, while sub-$1,000 GTX 1050-powered laptops like Dell’s own G3 15 typically settle for between 30-45 fps. Now, a word about heat. While playing Rise of the Tomb Raider, I noticed that the Dell G7 15’s cooling fans were roaring and the chassis got uncomfortably hot, particularly near the top of the keyboard and a tad to the right. Indeed, the 7, 8, and 9 keys got so hot that they felt like they were burning my fingertips. After about on hour of Rise of the Tomb Raider, I check the G7’s CPU package temperature and got a reading of 98 degrees Celsius (208 degrees Fahrenheit), hot enough to boil water and a mere two degrees shy of the Core i7-8750H’s maximum operating temperature. The CPU also engaged thermal throttling repeatedly in an effort to cool things down.